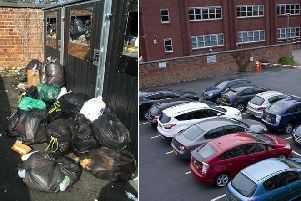 Cash-strapped Northamptonshire County Council borrowed £3.45m to buy an industrial unit in Kettering six weeks before it declared it couldn’t balance its books. The authority bought the site at 14 Orion Way on December 22, 2017, as part of a long-term plan to build its own commercial property portfolio to generate income. The decision to purchase was made by officers who were part of a ‘commercial investment board’ as well as one senior councillor. Carter Jonas brokered the property deal for NCC and was paid 0.5 per cent of the purchase price - £17,250. Just six weeks after buying the unit, at the beginning of February 2018, the council announced that it couldn’t meet its financial obligations and issued a section 114 notice. The purchase was uncovered during an investigation by the Bureau of Investigative Journalism which found that the number of local authorities in England buying investment land or buildings has doubled in the past two years, with local authorities buying commercial property to bring in extra revenue to help balance their books in the face of government cuts. Some commentators say this is a risky strategy, akin to gambling public money on the property market. In June 2017, Northamptonshire County Council’s cabinet met to set out its strategy for building a commercial portfolio with up to £20m of borrowed money to be spent in the first year plus a potential extra £10m on the cards if things went well. Originally, the plan was for a commercial investment board made up of four officers and the cabinet member for finance Cllr Robin Brown to find commercial property to buy up. The council’s cabinet was to make the ultimate decision on whether to make the purchase or not. However, just two months later, and after a number of failed bids for property, the cabinet met again and decided it did not need to have sight of all investments before the buying process could take place. A report, written by Assistant Director of Assets Ian Boll, said that the speed of getting decisions made by cabinet was making bidding difficult, and therefore all decisions should be delegated to his commercial investment board, who would then get the agreement of the chief finance officer. It said: “When submitting bids, it has been further highlighted that delays and risks that the market perceives from a ‘subject to cabinet approval’ bid put the council at some disadvantage in comparison with organisations and individuals that are able to demonstrate higher level of agility in their transactions. “While the council is considered to be trustworthy organisation in transactions, until it has a firm track-record of bringing forward acquisitions to completion, any negative perceptions will affect the likelihood of bids being successful. “It is, therefore, proposed, that assistant director assets and capital is granted delegated authority to agree the terms of purchases without the need for cabinet approval. This would be subject to the acquisition being agreed by the commercial investment board and to the approval of the section 151 officer and cabinet member for finance. There appears to be no mention of the purchase in the publicly-available Northamptonshire County Council cabinet minutes for January, 2018, the month after the purchase was made. Members may have been informed in private session without the scrutiny of the press and public. Liberal Democrat County Councillor Chris Stanbra said that the authority’s portfolio plans had had a degree of cross-party support, adding: “The issue here is one of transparency. “We should be open about things after the fact. “When you’re considering the investment, of course you don’t want to be telling people publicly how much you’re going to pay. “Afterwards there’s no reason for it to be kept secret. “There needs to be a mechanism where the public can be sure their money is being spent well. According to the latest Government figures, NCC’s current annual spending is £696m. Between April 2016 and September this year, its usable financial reserves dropped by a huge 59 per cent. Its current debt is £603m, which represents a massive 86 per cent of its annual spend. The authority has increased its borrowing by £76m since April 2017. Crucially, local authorities can borrow through the public works loan board or from each other at very low interest rates. This means it often makes financial sense to them to keep their own money in the bank, earn interest on it, and spend loaned money to buy property to generate a rental income. However, there are concerns that this widespread practice is creating a financial bubble that could cause meltdown in local government if there was an economic downturn. A Northamptonshire County Council spokesman said: “There are rules about borrowing – the main key concept on whether we borrow or not is whether there is a benefit foregone. For example - if we used capital receipts that money would not then be earning interest. Liberal Democrat leader Sir Vince Cable has suggested councils were ‘gambling’ with public money” as many of the investments are funded through borrowing, saddling some authorities with debts far beyond their spending power. Don Peebles from the Chartered Institute of Public Finance and Accountancy (CIPFA) said councils should be wary of becoming dependent on commercial income, adding: “Commercial income itself is volatile. There’s no guarantee that it will continue at a stable rate. That can be compared with the traditional funding streams received by local councils which are, notwithstanding the downturn in recent years, usually stable. “The second concern is the extent to which local authorities can be overexposed by taking out debt over a long period of time relative to the assets they are procuring. They will still have the debt repayment to fulfil irrespective of what happens to that asset. What that means is council services are directly related to the vagaries of the commercial property market. “If you look at the most extreme examples, there are public services used by vulnerable people which are dependent in the future on how well rental income in the property market is doing.